In iMovie, when you delete an event, have you seen the dialog box that says 'All media files an d projects in this event will be deleted. Clips used outside this event will remain in your library.' Do you wonder if the original media files get deleted too? In other words, when you delete an event in iMovie are you deleting iPhoto movies too? Well your not, when you delete iMovie events the original iPhoto movies that you may have used/linked to are not touched. After your done with creating your masterpiece in iMovie and you share it to YouTube, you are safe to remove the event without destroying the original video source. This will save a lot of disk space and iMovie Memory. I tried different things to fix the keyboard, I notice that the battery level was low, so I replaced the batteries with fresh Energizer ones. I also tried disconnecting and reconnecting the keyboard, but that would work for a while but then the space problem would return. Nearly every electronic device is subject to radio frequency (RF) interference from external sources if inadequately shielded, designed, or otherwise configured to be compatible. As a result, iPhone may cause interference with other devices. This got me thinking, near my computer keyboard, I had my iPhone 5s. When I moved it away from the keyboard, I notice that the space issue stopped! Very strange. For some reason it appears that the iPhone was causing some type of interference with my Bluetooth keyboard. Tip your Keyboard upside down and shake anything that might be stuck. Move away anything that might cause interference with the keyboard. Over the past couple of weeks, I have been using iMovie 11 a lot. I have been getting really good at learning all the tips and tricks to be more efficient and building better Vlog video clips. Once you learn some of the key keyboard shortcuts you can cut down production time and focus more on creating better videos. If I need to do some complex typing and use it in iMovie, I will create it in Keynote, then Export it from Keynote as a QuickTime Movie in timed advance mode (not manual advance). I will then use it in iMovie. With Keynote, you have total control over the font, the background color, the size, and hundreds of text effects. The key thing to remember is to always export the Keynote sides in timed advanced mode. There's lots of great slide making examples on YouTube, all of these slide types can easily be exported to add some cool effects in your movie. Macintosh users should be aware of any file that from gophoto-it. This is a pretty bad hijacking software and will control Chrome, Safari and Firefox on your computer. If you have been experiencing any strange behavior when your clicking on any websites, such as strange popups saying you should install an update utility software you may have a bad browser extension. You should see if you may have inadvertently installed the gophoto-it software. Basically what 'GoPhoto.it' does is add an extra bit of code to every webpage you load in your browser and they can manipulate what you do. For example, you may want to go to product page on Amazon.com, but GoPhoto.it will send you to another page or product on Amazon. 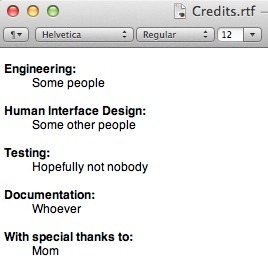 In the software installer is a credit.rtf file with the above contents. Satisfied now that this isn't legit software? Click Shift-Command-A to open Firefox Add-Ons. If you purchased a iMac in 2012, chances are that you have an iMac Mid-2011 model. You should consider getting more memory to help performance and allow you to do more with iMovie and iPhoto. Most likely that you didn't add memory when you purchased the computer and only have 4GB of memory. Apple made the Mid-2011 model easy to upgrade the memory, so you don't need to bring it to a dealer or the Apple Store. Certainly if your uncertain about adding memory to the computer, you should consult an expert. However before you do, watch this video to see how easy it is to install. Crucial is one of the highest rated manufacturers that makes the memory. You can purchase them at Amazon Prime, MacSales.com or BestBuy.com. This weekend we experience a serious hard drive crash with our 2T Buffalo DriveStation. Basically the drive stopped working in the middle of coping over large amount of data. As a result, when we re-mounted the drive the drive showed up empty in Mac OS Maverick and Windows 7. The drive is using NTFS format, which isn't 100% supported by Apple, but should be fine for coping data. When the drive would mount, I saw that at least 300 GB of data was being used, but I couldn't see any files, in Finder, Terminal or in Windows 7 using Parallels 9. I tried to run chkdsk on Windows 7 and it wouldn't work in the Parallels environment. Under Parallels, Windows see's the connected external drive as a Network drive. Turns out that the chkdsk app doesn't work with network drives. When we connected the drive to a laptop running Windows, it came back as not able to fix the disk. I tried numerous times using the fsck tool on the Macintosh and it came back as saying that it couldn't connect to the drive. I checked various options that Apple and other users suggested, but they didn't help. First Aid wouldn't work since it's using the NTFS format. We are not finished yet. We need to buy another hard drive, as we no longer trust the integrity of the Buffalo DriveStation. Once we get another hard drive, we'll copy the recovered files to the new hard drive. Recently I notice that the application/service 'com.apple.medialibraryservice.xpc' was bouncing in my computer dock. I did a quick search on the internet to see what was going on. I wasn't able to find a firm answer. I did discover that this was happening when I was importing some photos via iPhoto. Some of the import were movies and some of those movies were using the new 'Slo-Mo' feature on the iPhone 5s. I am guessing that the application was bouncing because it was rendering the 'Slo-Mo' movies as it was importing them. If you have a an old Powerbook G4 laptop in your home, you may still be able to put the computer to valuable use! Here are three things to do with an old Powerbook G4 laptop that you may not have thought of. First off, having a Powerbook G4 on at idle uses 21 Watts per day which will cost you .04 cents per day or $16 a year. So there's very little cost to having the computer plugged in. During your morning commute, have you ever heard of a joke that you would like to hear again. What was that song you heard for the first time? Was there a time you wish you could replay that broadcast? Well now you can. Using Audio Hijack Pro and a simple audio cable hook up to your radio, you can set it up to record your radio show that you listen to every morning. You can set it up so that it only keeps a week's worth of clips. Basically set it and forget it. You can get the clip that you need when you need it and not have to worry about running out of disk space. Advanced Macintosh users can even set it so the audio file is emailed or placed in a dropbox folder to access when your away from home. Don't waist valuable space on Dropbox for common files that you use at home! Put some common library files on your Powerbook and keep it on the network. Some common library files may include manuals of appliances in PDF, Microsoft Word letter templates and others. This is great way to keep a single resource for the entire household. It's better than a shared drive since you can encrypt the drive and perform some productive actions. For example, you can set up a folder action to convert any Microsoft Document to a PDF file. If you still have a large collection of music CDs around your house, keep a digitized version on your Powerbook. This will make it much easier to find your favorite music collection. Why keep Christmas music on your main computer all year long? Using the Powerbook G4 as your central music hub is great for playing music on the network tv too. If you have a Powerbook computer, in storage or use it frequently for files, you should consider getting a USB Flash drive to copy the data on the computer. This will make it very easy to have an off line backup of your data should something happen to your computer or hard drive. This is also handy for those times when you want something off the computer and don't want to have to boot it up. Apple's Disk Utility has the ability to create a complete copy of your Hard Disk as a Disk Image. This is practical way of backing up your computer since everything is copied, you won't miss a critical library file or anything. You can then open this disk image on any Mac computer, such as a newest laptop or iMac. Before you start the backup, you should clean up your computer - get rid of anything you don't need. You may want to delete already back up photos, music and other files. Don't forget to empty the trash, in your applications, such as iPhoto and the Desktop. You may save additional space by deleting the browser cache from Safari and Firefox. Connect the USB drive to the computer. I suggest calling it 'PowerbookG4-Backup' Tip: There's no need to add the date to the name because it will have the time stamp. Compression is the best image format type for back up. The other options would be good if you plan to modify the disk image later. For example change a file that you commonly use. If you have any sensitive tax or government data, use one of the encryption. Keep in mind that this will add additional time and size to your backup. Click Save and the process starts. After the backup is completed, you should validate that the backup is done by opening the disk image in another computer. Once the process is completed, label the outside of the USB drive so it will be easy to find later. This afternoon I stopped at the Apple store on Boylston Street in Boston's Back Bay with a question about the new Pages application. Basically, how do I get the latest updated version for Free. A couple of weeks ago Apple announced that along with giving the latest version of MacOSX away for free, that they would also give away the entire suite of iWorks products. The problem was that I haven't been able to get it for free since in the App Store on my iMac it still says that it's $19.99. I did have the iWorks '08 on my computer. Open up the Apple App application on my iMac. Sign out of the Apple Store. Then the prices in the store should be updated to reflect that I am eligible for the free upgrade. I'll have to try this out tonight to see if this infact works. If it doesn't he suggested that I call the Apple Store at 1-800-676-2775. Apple does something every major release that annoys me and I am pretty sure that I am not the only developer that encounters this. Apple makes some changes to some of the root UNIX configuration files without telling the user why they did that. As a results, I'll see weird behavior and I have to figure out why. Let me back it up a bit. I know I am getting a little technical, but bare with me here. Since Mac OS X Beta, I have been playing around with the core UNIX that is a part of Mac OS X. One of those files is Apache, which is the primary Webserver that comes with Mac OS X.
Apache is a very powerful Webserver that allows you to do all sorts of cool things. If your interested you should check out "Cool things you can do with Apache." I changed the Apache configuration file to enable PHP and point the root folder to a different directory. I do this so that it's easier for me to do changes, and I enjoy writting code in PHP. Back to the issue, in every release of Macintosh OS X, and in some minor updates, they backup the configuration file that I have and enable their own Apache configuration file. Why? Is there some cool feature that I need to know about? Security bug fix? All I ask is for Apple to tell us why they changed the default apache configuration file. Developers can then assess the risk of using the updated conf file or reverting to the previous configuration file. /etc/apache2/httpd.conf~previous - this is what apple renames your old config file. If you have an old PowerMac G3/G4 and looking for replacement screws to secure your PCI cards. You need to look for Apple Part 922-5974. These screws are still very expensive to get. I found a place that was selling 5 screws for almost $100! Over price for computer part in a computer that is more than 10 years old. The specs for the screws is M3.5x 7.5mm. There are several stores on eBay that are selling the screws for about $10 for 100 pieces. Still a lot for a small screw. You may have better luck searching for similar parts at some hardware stores. I have heard that some people had luck at True Value hardware stores. Replacing Text in multiple files is one of the reasons people use BBEdit. We all have some need to replace text, and more often than not it's with multiple files. Over the past 10+ years, I have found that BBEdit is the easiest way to find and replace text in multiple applications. What's cool is that BBEdit also saves your search/replace so that you can reuse the search pair again. Extremely helpful when I needed to replace Window line breaks with Macintosh line breaks or vice verse. One of the strong points to BBEdit's simple search and replace is the use of Text Factories. This functionality allows you to perform multiple search and replace at the same time. So if I had 200 files that wanted to replace all the line breaks to UNIX format and change the copyright year to 2013, I can do it in one simple action. BBEdit then shows you a report of the changes that it would perform and allow you to decide to accept all changes. Very cool and very powerful. In short, BBEdit is a great application and worth the $49.99 price. Your getting an application that can be used for any text functionality that you do on your Macintosh. If you tried the application in the past, I encourage you to try it again. Part of the core problem was that the Parallels log file wasn't telling me what was going on. I would see lots of PET_VM_EVT_VM_CONFIG_CHANGED, PET_DSP_EVT_VM_DEV_STATE_CHANGED and PRL_WNG_NO_OPERATION_SYSTEM_INSTALLED. But no clue what is going on. Basically if you get the 'Click Start' to launch after a few seconds after starting the process it means that your Disk Image is bad. 2. I was unable to modify a disk image. This is a problem with Mountain Lion and not something that you did. Apple updated the DiskCopy tool so that DVD master disks are read only. To get around this, I had to boot up my old computer and then created the disk image on that machine. That created the opportunity for me to edit the disk image. Looks like I am in business and looking forward to installing my applications! Last night I decided to connect an external monitor to my Powerbook G4 so that I could work with a larger screen and not use the smaller laptop screen. Apple calls this clam shell mode. To do this you need to connect a USB keyboard, USB mouse and an external monitor then close the laptop. While I was installing some old drivers and in the process the keyboard language type got converted to Hiragana. I am not sure exactly which driver made the change, as I installed USB Overdrive, MacAlly IceKey Driver and SteerMouse. I am thinking it was SteerMouse as it was the first driver I installed. The Logitech MX 518 mouse wasn't responding when I click and it appeared to move too fast. Later I notice that the USB wasn't working, as I was typing strange characters on my Macally IceKey keyboard. SteerMouse was created in Japan, so that might be another clue that it was the application that changed my keyboard type to Hiragana. I am going to uninstall all the drivers and third party utilities to see if I can identify the root cause and get everything working. Part of the problem I am running into is that I am using 10.5.8 on my laptop and some of drivers don't support that any more.